Announcing a new program as part of the Dungeon Masters Guild. As we talked about on Dragon Talk back in January 2016, the goal of the guild is to create a platform for fans of Dungeons & Dragons to form a creative community, and it most certainly achieved that after a fashion. With contributors in the thousands and downloads in the hundreds of thousands, the links between fan creators and fan consumers were growing strong. As the architect of the Dungeon Masters Guild, I was (and still am) flabbergasted. One thing we noticed after watching the platform for a while was that our fan creators weren’t necessarily talking to each other. For the most part, each fan creator has worked in a silo of their own creation, making contributions to the guild as solo artists, and while they have been coming up with some fantastic products, we know from our experience on the D&D team that the best D&D products are collaborative efforts. On the Dungeon Masters Guild right now, there is a smorgasbord of delightful designs to sample, and at very reasonable pricing I might add. There are so many adventures and monsters and other awesome stuff up there, in fact, that we’ve gotten feedback from fans that it is sometimes hard to know where to look on the DMs Guild to find exemplars of design. Say no more! In the interest of shining a spotlight on a handful of talented creators as well as start forming the creative community of collaborative co-designers I’ve always dreamed of, I bring you the GUILD ADEPT program. On September 8th, when this incredible adventure filled with dread delights becomes available at your local core hobby retailer, the first round of sheer AWESOMENESS from our GUILD ADEPTS will also become available for purchase and download on the Dungeon Masters Guild. 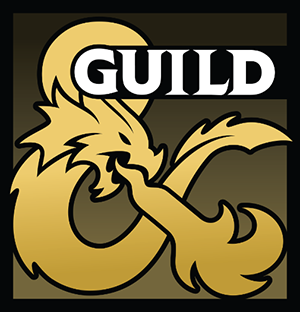 When they do, you will know them by this new, gold Dungeon Masters Guild icon. That’s right! In the parlance of our digital gaming brethren, we’ll have FIRST DAY DLC. I don’t know about you, but I’m totally amped! I mean there seriously aren’t enough exclamation points in the world to allow me to express this!!!!!!!!!!!!! Seriously!!!!!!!!!!!!!!!!!!! Not enough!!!!!!!!!!!!! The next exciting thing I must say is that we’re going to engage the GUILD ADEPT program for each of our published products, and each time we’re going to give some number of designers, that have been both active and successful in the Dungeon Masters Guild, the opportunity to participate. It won’t always be the same group, and the group won’t always be the same number of folks, but it will be fun and exciting to see what wonders they create. If you want to get involved, there is no time like the present. While there is no sure-fire recipe for becoming a GUILD ADEPT, the best way to get our attention is to A) play in our sandbox and explore creative expansion to storylines that D&D is releasing; and B) make some good money doing it. It isn’t always about sales, but I would encourage you to put a price tag greater than FREE or PAY WHAT YOU WANT on your work. This really helps us to determine if your fellow D&D enthusiasts are willing to pay cash-money for your stuff. I look forward to seeing what everyone comes up with next. Let the creating begin!